What's being called a "Green New Deal," a wide-ranging effort to tackle climate change, with overtones of President Franklin D. Roosevelt's sweeping 1933 New Deal to counter the Great Depression, was unveiled by Democrats Sen. Ed Markey and Rep. Alexandria Ocasio-Cortez Thursday on Capitol Hill. "Climate change and our environmental challenges are one of the biggest existential threats to our way of life, not just as a nation but as a world, and in order for us to combat that threat we must be as ambitious and innovative in our solution as possible," Ocasio-Cortez said at a news conference. The wide-reaching proposal calls not just for a massive overhaul of the nation's energy sector over the next 10 years, but also investments in the country's education, infrastructure and health care systems and a redesign of the entire U.S. economy. Markey compared the Green New Deal resolution to President John F. Kennedy's initiative to land a man on the moon. "I say today that it is time for us to be bold once again," he said. "We have the technology to do it. We have the moral obligation. We have the economic imperative. We just need the political will to get this done. The sun is setting on the dirty energy of the past. Today marks the dawn of a new era of climate action." The House resolution states "that a new national, social, industrial and economic mobilization on a scale not seen since World War II and the New Deal is a historic opportunity." The resolution is non-binding, meaning if it does get a vote and passes it wouldn't become law, but is a way for Ocasio-Cortez of New York and Markley of Massachusetts to push for action on climate change, which they hope to make one of the Democratic Party's top issues in the 116th Congress. Ocasio-Cortez called it a "first step" in defining the problem and the "scope of the solution." "Today is the day that we truly embark on a comprehensive agenda of economic, social and racial justice in the United States of America," Ocasio-Cortez said. "That's what this agenda is all about. Because climate change - climate change and our environmental changes are one of the biggest existential threats to our way of life - not just as a nation but as a world." Though the Green New Deal has support from as many as 40 congressional members, including a few 2020 candidates, it lacks avenues to become law of the land -- from both the Republican-controlled Senate and White House, and possibly the Democratic-controlled House. "The question isn't whether all Democrats can support this resolution," Markey insisted. "It is if any Republican will support this resolution. The question should not be if we can do it. The answer should be when we will do it." House Speaker Nancy Pelosi told reporters she was "very excited" about the proposal Thursday but also played it down as just "one of several or maybe many suggestions that we receive" in an interview with Politico the day before. 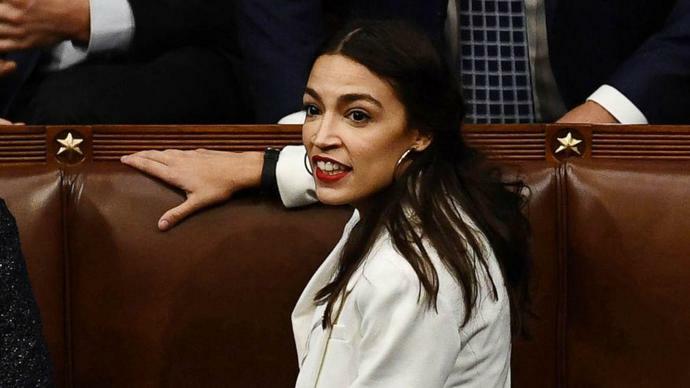 Pelosi also announced Thursday that Ocasio-Cortez, despite being a key force behind the Green New Deal, would not be serving on a House Select Committee on Climate Crisis that Pelosi created -- one which Ocasio-Cortez has criticized forlacking political power. Ocasio-Cortez was invited to be on the committee, both Pelosi and Ocasio-Cortez confirmed Thursday. But Ocasio-Cortez said she wasn't joining it because it's an "investigative" committee and she's preoccupied with other subcommittees she serves on. She insisted she shared common goals with Pelosi on climate change. "They're tackling the investigative piece, we're tackling the legislative piece," Ocasio-Cortez said. "So I don't think that this is a snub. I don't think this is anything like that." Pelosi, who experienced the political downside of pushing green legislation considered too progressive for its time -- when she tried to get cap-and-trade legislation passed -- explained earlier Thursday what she's looking for in climate change legislation this congressional session: "an evidence-based, well-defined approach to how we go forward to make a difference." She hasn't seen the Green New Deal proposal, Pelosi said, but applauded the enthusiasm it is has generated on climate change. "Time is of the essence. We welcome the enthusiasm that is there," Pelosi said. "The Green New Deal points out the fact that the public is much more aware of the challenge that we face and that is a good thing because the public sentiment will help us pass the most bold common denominator, bold initiatives, with the interest in again saving the planet, while we create jobs, protect the health of our children and pass the planet on in a very serious way." Ultimately, the Green New Deal focuses on the alarming findings of recent climate change reports -- increasing numbers of natural disasters like wildfires, droughts and floods all because of rising levels of greenhouse gases; mass migration expected from affected regions; more than $500 billion in lost output by 2100 -- and suggests massive solutions, like bringing greenhouse gas emissions all the way down to net-zero. The resolution also calls for 100 percent of U.S. energy demand to be "clean, renewable and zero-emission" and for a redesign of transportation systems nationwide in order to eliminate pollution and greenhouse gas emissions from the transportation sector. It calls to secure, "for all people of the United States for generations to come," clean air, clean water, investments in endangered communities for better resiliency in the face of natural disaster, healthy food, access to nature and a sustainable environment, as described in the resolution. Indigenous communities, communities of color, migrant communities, low-income workers, the elderly, young people and other groups are given a particular focus, deemed "frontline and vulnerable communities" because of the disproportionate effect climate change has had on these groups. "Climate change, pollution and environmental destruction have exacerbated systemic racial, regional, social, environment and economic injustices," for these groups, the resolution says. How would these goals come to fruition? The particular details aren't worked out in the resolution -- but the broad ideas include "spurring massive growth" in clean manufacturing, upgrading buildings around the U.S. to be more energy-efficient, working with farmers and ranchers to make farming more sustainable and investing in education for everyone. National and grassroots groups has mixed reactions Thursday. Some commended the effort -- including the group Sunrise Movement, which recently kicked off support for the deal with a sit-in in Pelosi's office -- but others criticized the lack of regulatory efforts aimed at fossil fuel production. "We urgently need a bold and ambitious Green New Deal that tackles fossil fuels head-on," said Wenonah Hauter, executive director of the progressive environmental non-profit Food & Water Watch. "We support the ambition and scale of this resolution, and we are heartened by its recognition that climate change poses a grave threat to healthy food and clean water, but any legislation that does not explicitly address the urgent need to keep fossil fuels in the ground is insufficient."